St. Patrick’s Day is one of those holidays that you’re probably already planning on celebrating with a few beers, but this year St. Patty’s falls on a Thursday, which means most of us will be headed to the office rather than the bar. That doesn’t mean you can’t have a Guinness with lunch — just that you should maybe have it in a little different form than your average pint. Like, say, a cupcake. 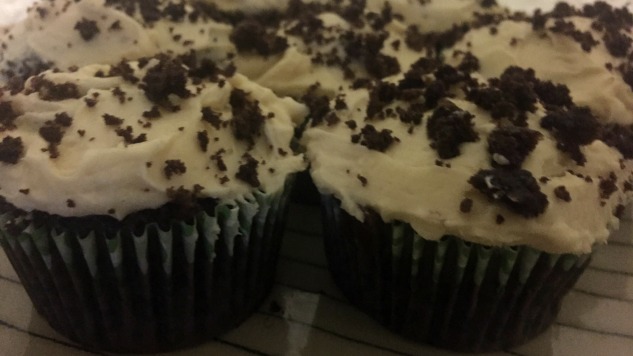 These cupcakes are a play on the Irish Car Bomb (although we’re not calling them that). They’re seriously easy to make, delicious, and are the perfect treat to bring to the office to celebrate with coworkers or to take along with you to a friend’s house for a weekend party. 1. Open your bottle or can of Guinness and pour one and a half cups into a measuring glass. Pour the remaining beer into a pint glass to enjoy while you cook. 2. Mix the cake mix according to the directions on the box, except where the box directions ask for water, replace it with your Guinness. So, if your cake mix asks for a cup of water, instead use a cup of Guinness. 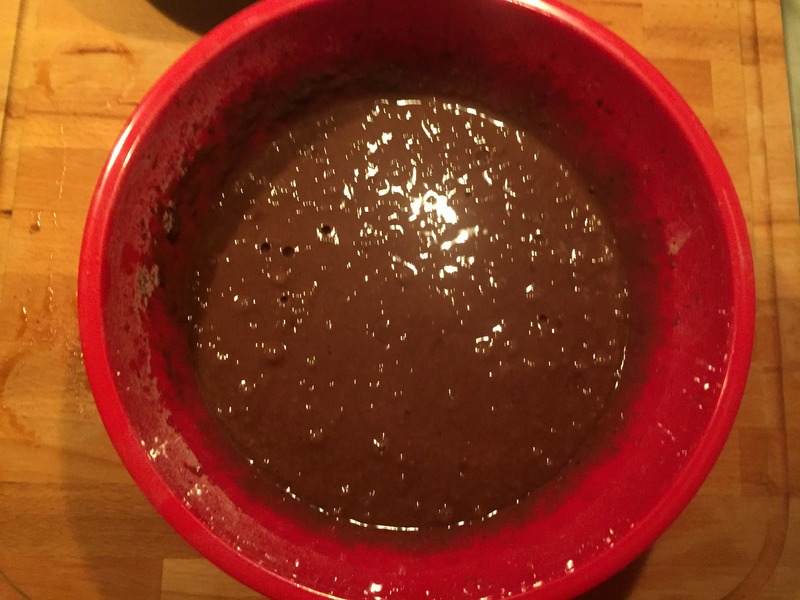 Whereas your typical cake can probably be made using a spoon for mixing, this is one time you’re really going to want to bust out your electric mixer. If you don’t thoroughly mix in the beer, bad things are in store for your cupcakes. When you mix, a good judge of whether you’ve done enough stirring is if you still see any bubbles from the carbonation in the beer. If you still see them? Keep on mixing. I’ve failed at many a batch of these by not stirring enough. When it doubt, stir a little more. No, really. 3. Put those cupcakes in the oven and get them cooking. 4. Take a few sips of that Guinness you poured yourself, and take a moment to marvel at how much you’ve accomplished already. 5. In a medium-sized bowl, whip your butter (it’s room temperature, right?) until is starts to sort of look like icing (see, I told you that you’d want an electric mixer). Once it starts to get a fluffy texture, start to slowly add in powdered sugar, mixing it thoroughly in before adding more. Look at you, you’re making icing! 5. Once you’ve added in all your powdered sugar, start to add in some Irish Creme. Bailey’s is of course the standard, but I actually used Ryan’s this go around. This is one place where you can experiment with what works best for you. Personally, I like to use roughly 4 tablespoons, which gives the icing a good flavor, without it being super boozy and overwhelming. My recommendation would be to start with two tablespoons, mix it in, taste it, and then add more if you want. That’s right, I told you to taste the icing. You’re welcome. You can probably go up to eight tablespoons. If for some reason your icing starts to have a liquid texture, go ahead and add in a little more sugar to compensate and bring it back to solid form. 6. Put your icing in the fridge so it can firm up a bit while your cupcakes finish cooking. 7. Drink a little more of your beer. 8. Take your cupcakes out of the oven and allow them to cool. Once they’re close to room temp, pull your icing out of the fridge and ice them up. I was a little over zealous in filling my cupcakes tins this batch (you want to only go roughly 2/3 of the way), and had one cupcake get a little too big for the rest of the class. That one I crumbled up and put on the tops of the other cupcakes for decoration. If you’re feeling fancy, you could do that, or add green sprinkles or shaved chocolate to the top. You just made beer cupcakes, really, the world is yours! Want to cook even more with beer? Check out this IPA Chicken Fettuccine we made last month!